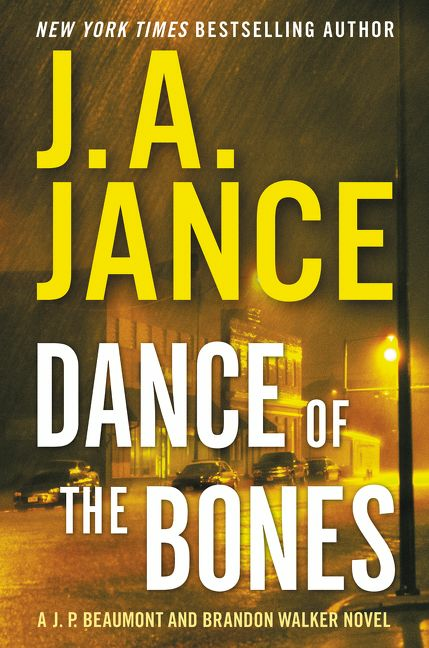 DANCE OF THE BONES by J. A. Jance is an action packed mystery infused with the legends and culture of the Tohono O’odham Indian tribe. Before each chapter there is an Indian story/folklore based on this tribe’s traditions. Jance readers know that with any of her books they will be treated to a riveting mystery with twists and turns. This fifth book in the Walker Family novels, the latest series, brings back all the wonderful characters including retired Arizona sheriff Brandon Walker and his adopted daughter Lani. Although billed as a joint J. P. Beaumont and Brandon Walker novel, Beaumont only makes what can best be described as a cameo appearance. The one thing these two crime fighters have in common is that both are retired. Their new duties include solving cold cases: Brandon with the organization The Last Chance while Beaumont is at loose ends when the Washington State Attorney General’s Special Homicide Investigation Team, has been dissolved. The antagonist is the evil character Ava Martin. She frames an innocent man that was arrested by Walker. Years later he and his daughter ask the retired Sheriff and The Last Chance organization to find the real killer and clear his name. It is in the style of a Colombo episode since the reader sees the case unfold, and how the initial crime shapes the present. As Ava tries to suppress evidence she eliminates witnesses by kidnapping and then killing them. Walker must find out who is behind all these missing people and murders. A fascinating character is Dr. Lani Walker. She is an example of how these Desert People are able to straddle the worlds of traditional Indian customs and modern day America. She is both a medicine woman and a medical emergency room doctor, a trained physician. Jance makes people aware of how the Tohono O’odham Indian tribe continues to carve a path between ancient and modern worlds, and she does it with dignity and respect. This latest Walker Family series has very well developed and interesting characters. Jance has created a very intelligent, entertaining, and suspenseful novel, one that keeps the reader on the edge of their seat as they feel they are part of the plot. Jance also gave a heads up about her next projects. Published toward the end of the year is a crossover novella, No Honor Among Thieves, which has Ali Reynolds working with Joanna Brady. Then her new novel, CLAWBACK, featuring Reynolds will be published with the plot based around a Ponzi scheme.